A common method of analysis is to read a piece of literature or informational text as a writer. This means that students analyze the author’s craft. 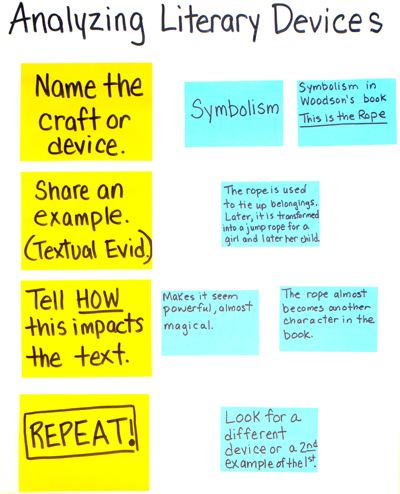 One of the most accessible ways to do this is examine how different authors use literary devices. At the beginning of our unit, I created this chart with a group of seventh graders. I added the four large sticky notes to the left side of the chart. Then, I told students that I was going to read a picture book out loud. I wanted them to listen and see if they noticed figurative language, symbolism, or irony in the text. Next, I read Jacqueline Woodson’s This is the Rope out loud. Then, I asked students what devices they noticed. One of the students suggested that the jump rope was a symbol. As a result, we explored symbolism. As a group, we moved through each of the steps, recording their ideas. At the conclusion, I told students that we would try this again tomorrow, but with a grade-level text. See ideas below for next steps based on the grade that you teach. This standard does not begin until fourth grade. For sixth graders consider expanded the list of devices up to four. I would still consider a shared text at this point, but move to a grade-level appropriate text. For more proficient writers with strong understanding of literary devices, let them select a text of their choice and do not specify which devices they must write about. Allow students to explore and choose what they highlight.